The dancing broke out in the audience with a 3-year-old fan, who inspired everybody else, all in anticipation of Rennie Harris’s RHAW, the long-waited concert performance by the junior troupe in their hometown. The dancers—Davion Brown, Kevin S. Rand, Mariah Tlili, Brandyn S. Harris, Shafeek Westbrook, Macca Malik, Courtney Klinger, Joshua Culbreath, Kyle Adam Simpson and Neka Chantol French—are all under 22 and some are headed to Harris’s main company, Puremovement. These young dancers have been dispatched by Harris as ambassadors for dance outreach at schools and in communities to get young people interested in the arts. 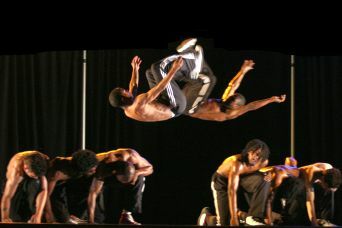 The visionary Harris uses the tag “hip-hop” as a mere entry point to a much bigger choreographic, educational and artistic purpose. Among the highlights—Raphael Williams’s choreography to “Across 110th Street,” scored to the soundtrack music by Bobby Womack, sets up a street-scene narrative of free-form breakout solos but drops in relaxed but tight unison work that shows the theatricality of the ensemble. The funk instrumental “El Barrio” by George Benson also featured finely appointed ensemble phrasing. A couple flies into a flash salsa during “El Barrio,” for instance—delightfully so, but revealing they could work on partnering. Harris continues to surprise with the theatricality of his pieces. He has an affinity for choreographing rock classics; this time it was a rousing, angst-filled youth dance drama to Queen’s “Bohemian Rhapsody.” “Peace and Love,” set to a pulsing track by Mandrill with voiceover narrative by Amani Na Mapenzi, has dancers moving against a film of violent images from the last 60 years, from KKK lynchings to World Trade Center bombings, unfolding as the dancers express emotions of alienation, unity and resolve in a powerful statement by Harris. If there was a quibble to RHAW’s eight-part sampler, it is that in many of the pieces, there could be more invention in the transitional phrases. Meanwhile, Harris continues to create exciting vocabulary while celebrating the genre’s old school, new school and future school. Harris’s son Brandyn is a virtuoso of his dad’s signature style; in a second his incredible mechanical locks break to complete fluidity. The dancers attacked the checklist of dance acrobatics—V flares that keep evolving; punch fronts; shoulder bounces; torsos dropping in lotus; head pirouettes; single-hand back vaults; somersault layouts—in eye-popping and low-to-the-ground ninja moves and slides. If there were an Olympic competition, this stuff would have an off-the-chart degree of difficulty.